Twenty years ago, the Wheaton Alumni magazine began a series of articles in which Wheaton faculty told about their thinking, their research, or their favorite books and people. 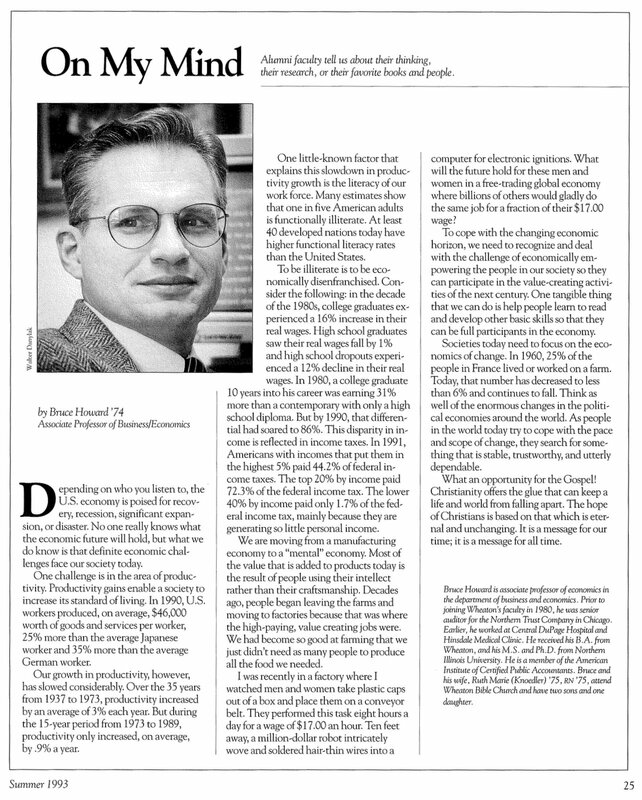 Professor of Business and Economics Bruce Howard was featured in the Summer 1993 issue. Depending on who you listen to, the U.S. economy is poised for recovery, recession, significant expansion, or disaster. No one really knows what the economic future will hold, but what we do know is that definite economic challenges face our society today. One challenge is in the area of productivity. Productivity gains enable a society to increase its standard of living. In 1990, U.S. workers produced, on average, $46,000 worth of goods and services per worker, 25% more than the average Japanese worker and 35% more than the average German worker. Our growth in productivity, however, has slowed considerably. Over the 35 years from 1937 to 1973, productivity increased by an average of 3% each year. But during the 15-year period from 1973 to 1989, productivity only increased, on average, by .9% a year. One little-known factor that explains this slowdown in productivity growth is the literacy of our work force. Many estimates show that one in five American adults is functionally illiterate. At least 40 developed nations today have higher functional literacy rates than the United States. To be illiterate is to be economically disenfranchised. Consider the following: in the decade of the 1980s, college graduates experienced a 16% increase in their real wages. High school graduates saw their real wages fall by 1% and high school dropouts experienced a 12% decline in their real wages. In 1980, a college graduate 10 years into his career was earning 31% more than a contemporary with only a high school diploma. But by 1990, that differential had soared to 86%. This disparity in income is reflected in income taxes. In 1991, Americans with incomes that put them in the highest 5% paid 44.2% of federal income taxes. The top 20% by income paid 72.3% of the federal income tax. The lower 40% by income paid only 1.7% of the federal income tax, mainly because they are generating so little personal income. We are moving from a manufacturing economy to a “mental” economy. Most of the value that is added to products today is the result of people using their intellect rather than their craftsmanship. Decades ago, people began leaving the farms and moving to factories because that was where the high-paying, value creating jobs were. We had become so good at farming that we just didn’t need as many people to produce all the food we needed. I was recently in a factory where I watched men and women take plastic caps out of a box and place them on a conveyor belt. They performed this task eight hours a day for a wage of $17.00 an hour. Ten feet away, a million-dollar robot intricately wove and soldered hair-thin wires into a computer for electronic ignitions. What will the future hold for these men and women in a free-trading global economy where billions of others would gladly do the same job for a fraction of their $17.00 wage? To cope with the changing economic horizon, we need to recognize and deal with the challenge of economically empowering the people in our society so they can participate in the value-creating activities of the next century. One tangible thing that we can do is help people learn to read and develop other basic skills so that they can be full participants in the economy. Societies today need to focus on the economics of change. In 1960, 25% of the people in France lived or worked on a farm. Today, that number has decreased to less than 6% and continues to fall, Think as well of the enormous changes in the political economies around the world. As people in the world today try to cope with the pace and scope of change, they search for something that is stable, trustworthy, and utterly dependable. What an opportunity for the Gospel! Christianity offers the glue that can keep a life and world from falling apart. The hope of Christians is based on that which is eternal and unchanging. It is a message for our time; it is a message for all time. 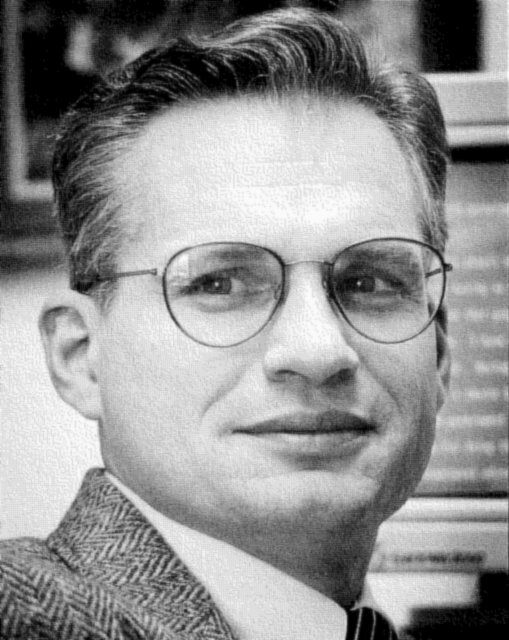 Bruce Howard is Professor of Business and Economics. Prior to joining Wheaton’s faculty in 1980, he was senior auditor for the Northern Trust Company in Chicago. He received his B.A. from Wheaton and his M.S. and Ph.D. from Northern Illinois University. Dr. Howard’s current research explores the impact of interest rates on consumer behavior with respect to the use of debt to fund purchases of consumer durables and housing. He has an interest on the impact of taxation at the state and local level. For the last several years he has been studying the historical underpinnings of societal values as they relate to ordering of economic activity. In conjunction with his teaching career, Dr. Howard maintains an active professional association with Tyndale House Publishers in matters of accounting, taxation and employee benefits. He also has work experience in health care administration and banking. In recent years, Dr. Howard has traveled to Kazakhstan to teach and present papers at Kazak-American Free University and University of Kazakhstan.